The main house that exists today is, for the most part, the house that Jefferson lived in during his retirement with the family of his surviving daughter, Martha Jefferson Randolph. Physically, the house is a fine example of Roman neoclassicism with influences from contemporary French architecture. 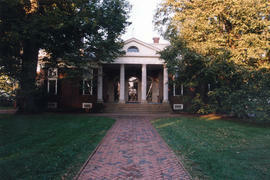 Enlarged by 1809, the house itself has twenty-one rooms and is 100' long, 87'-9" wide and 44'-7" high (to oculus of dome). Often viewed as extensions of the main house, the two l-shaped, terraced wings contained further living and support spaces where some of the essential domestic work of the plantation was done.